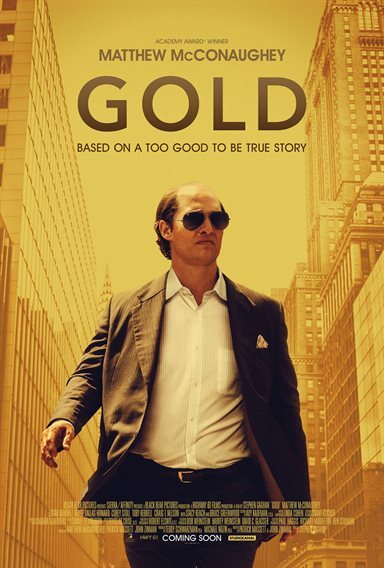 Download Gold in Digital HD from the iTunes store. Gold images are © Weinstein Company, The. All Rights Reserved. In 1995, Bre-X, a Canadian mining company announced to the world they had found significant gold deposits in Busang, Indonesia. Overnight, they became a huge success and their penny stock suddenly was worth significantly more money per share. However, by 1997, everything fell apart when independent consultants couldn't replicate the finding and the world discovered the whole operation had been a scam. Though the names have been changed, the 2016 film Gold closely resembles the events of one of the biggest Canadian stock markets scandals in history. Kenny Wells (Matthew McConaughey; Dallas Buyers Club) inherited his family mining company and watched it flounder out to near extinction. Down on his luck, Wells had a vision of riches in Asia and tracked down a prospector he had met previously by the name of Michael Acosta (Edgar Ramirez; Point Break) and basically begs Acosta to work with him. Scraping together some funds, Wells and Acosta start to mine in the jungles of Indonesia but are plagued by rains and dwindling finances. Suddenly, while Wells lays in a malarial haze, Acosta claims to have found gold which changes their fates forever. Overnight, Wells goes from the pariah of the mining world to their golden boy, earning accolades and enticing investors from all over the world. The company stock rises rapidly with the discovery and Acosta and Wells are celebrated. However, less than two years later, as the success takes its toll on Wells' personal life, the greatest mine find of the 1990's falls apart when it is revealed to be a scam. Trading of the company stock is suspended, Wells is under investigation by the FBI and Acosta is nowhere to be found, along with shares of the company stock he sold to the tune of $164 million. McConaughey is excellent as the once unlucky bottom feeder Wells who obtains fame and fortune, only to lose it all again, and Ramirez is sincere in his portrayal of the prospector who supposedly strikes gold, while all the while lying through his teeth. Bryce Dallas Howard (Jurassic World) is good as Wells' longtime girlfriend who bails on him when he changes, only to be there when it all falls apart. The issue of the movie is that at no point is Wells likable enough for the audience to want to root for him. While we see somewhat of a transformation after the gold strike, we weren't invested enough in Wells from the outset to laud his success and empathize with his downfall. Shot primarily in Thailand, the cinematography is almost magical. As the camera sweeps over the landscape, we are transported to a savage yet beautiful location. This helps set the adventurous mood and makes the audience feel for their journey over this treacherous terrain. The 1080p high Definition video accentuates this, as the greens are lush and plentiful and the DTS-HD Master 5.1 audio is full and voluptuous with the sound of the jungle and mining machinery. The Blu-ray quality, while today's industry standard, helps to make the film an enjoyable experience overall. The extras feature a few short segments. 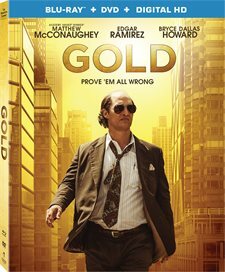 There is audio commentary from director Stephen Gaghan (Syriana), and five-minute long pieces on the Origins of Gold, The Locations of Gold and Matthew McConaughey as Kenny Wells. All are somewhat interesting but don't make the movie necessarily any more enjoyable. While not his best performance, McConaughey is still interesting, as he adds dimensions and layers to an overall boring guy who just happens to have a dream and it is this dream that keeps us interested in the film. Once you watch the movie though, you will want to Google the original Bre-X scandal and spend the next few days wondering if Wells (Walsh in real life) was in on the scam from the beginning.